Stellah was orphaned at a young age, but despite her tough start in life she has always aimed high. She was one of the first graduates of Generation Kenya in 2016, and soon found a job at Subway, the quick-service restaurant chain. She’s already been promoted to assistant manager. Stellah was born in rural Kenya, and was just seven years old when her mother passed away. A cousin took her in, but had little money to spare. “My life was very difficult,” says Stellah. But she persevered, completing high school and going on to obtain a one-year IT diploma. She began teaching school children, but wanted more. That ambition took her to Nairobi, where she heard about Generation and enrolled right away in our retail sales program. At the age of only 21, Stellah was promoted to an assistant manager position at Subway. She credits Generation for helping build her confidence—and she also benefited from close mentorship from a manager who spotted her potential. Stellah’s new role came with a salary increase, and she is now saving for the future as well as supporting her grandfather. 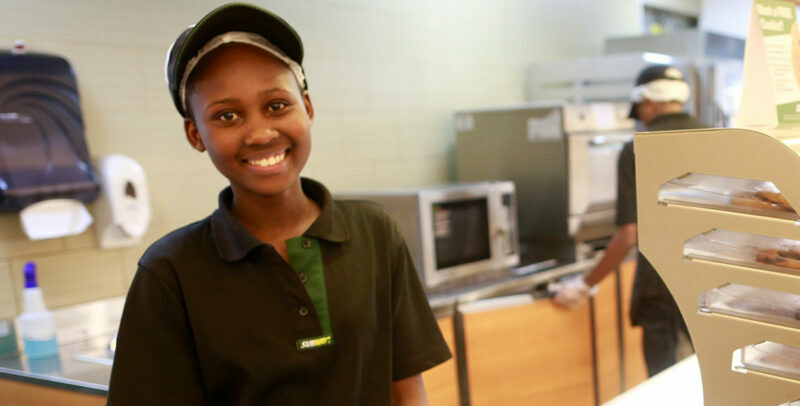 “My next step is to become a manager at Subway, but some day I want to continue my education,” Stellah says.